The Authorize.Net integrations for WooCommerce were among some of the earliest plugins we built at SkyVerge. At that time, Authorize.Net had several different APIs that allowed you to do different things: the AIM API handled directly processing payments, the CIM API handled securely tokenizing saved methods, the DPM API handled embedded payment forms, and the SIM API handled off-site transactions. As a result of all of this separation, there were 4 different extensions to do different types of payment processing for your WooCommerce store. While this ensured that a merchant could use the exact feature set they needed, it also meant it was confusing to know which plugin to choose, and as developers, we had a lot of duplicate code to maintain (the basic plugin structure and transaction handling was pretty consistent). This plugin takes all of the best parts of the AIM, CIM, and SIM integrations our team had built, rolling them up into one plugin. Over the next couple of months, we’ll be migrating all WooCommerce sites to this new unified extension. Existing CIM plugin users have just seen this as a version 3.0 upgrade, so you’re probably using the unified plugin already! For AIM and SIM users, we’ll need a couple additional steps. First, over the next month, we’re working with the WooCommerce.com team to add subscriptions for the unified plugin to your account (to match, then replace, your current plugin subscription). 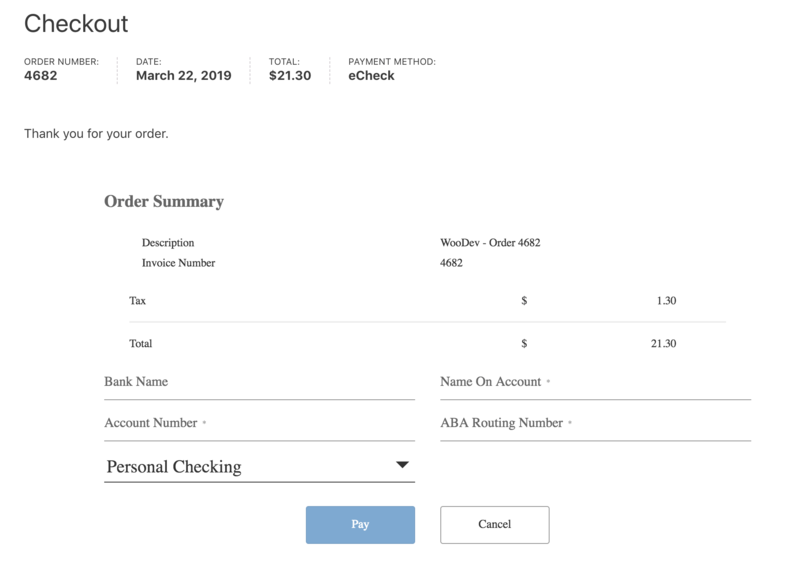 When this process is completed and every WooCommerce Authorize.Net merchant has a subscription for the unified plugin, we’ll begin to roll out updates for AIM and SIM users. This update will offer a one-click migration: when you upgrade, you’ll be asked to migrate, and when you’re ready, the new plugin will be installed, activated, and connected to WooCommerce.com. It will migrate all settings and transaction information seamlessly, so with a single click, you’ll be ready to move forward with the latest and greatest from Authorize.Net! If you’ve already been using the CIM extension and upgraded to Authorize.Net version 3.0, the great news is you may already see these features. Check out what you can now do as of version 3.0 below. 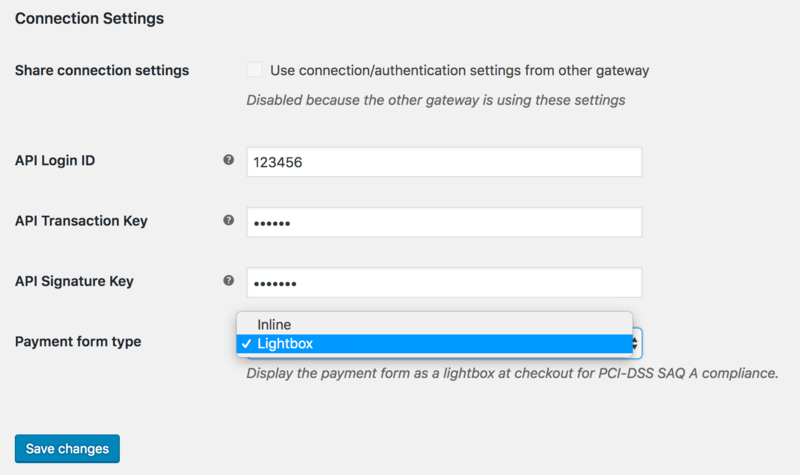 In older versions of our plugin, you could enable Accept.js from Authorize.Net to improve the security of your payment forms (meeting SAQ A-EP levels of PCI compliance). There was a setting for this because it required extra configuration in your Authorize.Net account. No more! Authorize.Net has made this configuration available via their API, so Accept.js can come standard for all stores. 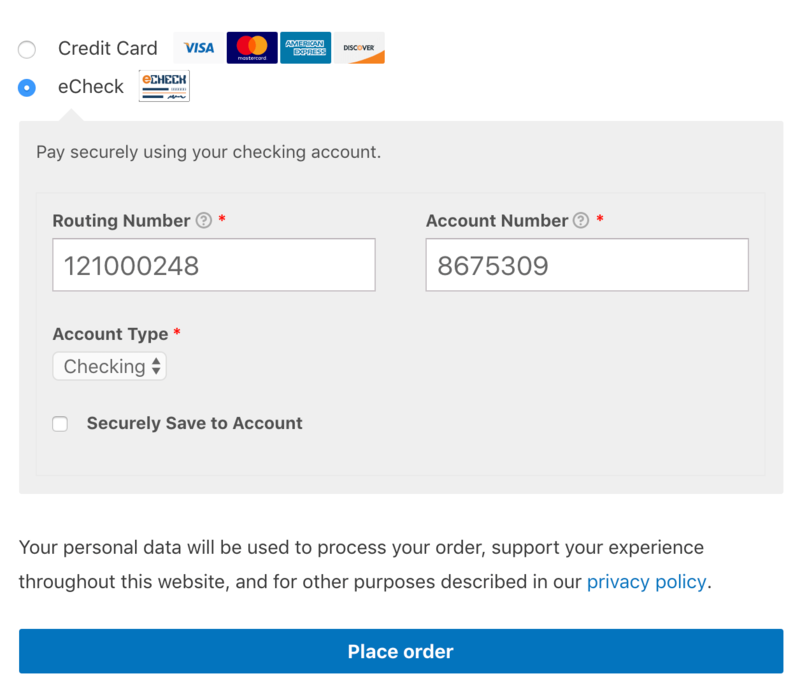 When you connect to Authorize.Net, the plugin automatically configures Accept.JS, so the inline payment form security is improved transparently. As a result, you’ll see we’ve removed these Accept.js settings in the plugin. 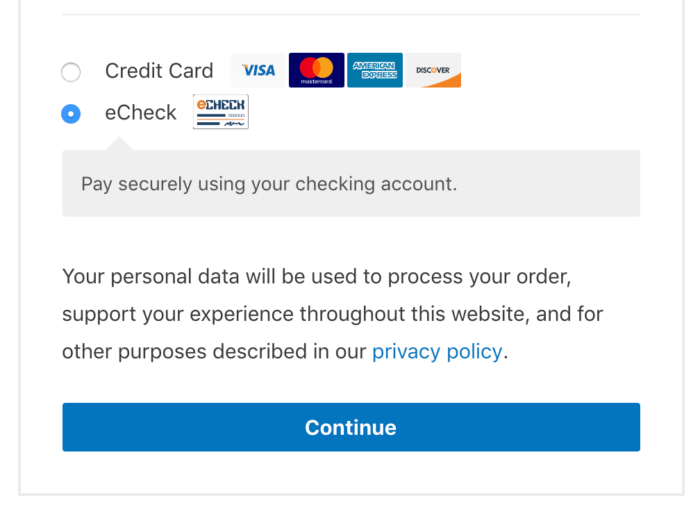 A quick note: the hosted eCheck form does not yet support saved payment methods! If you want to enable tokenization, you should use the inline eCheck form. If you switch to the hosted eCheck form, your customers will not be presented with payment fields at checkout. 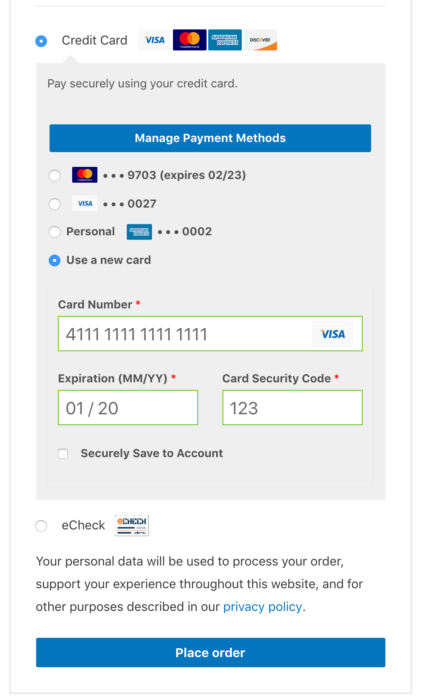 Instead, these are securely embedded in the payment page following checkout for your customers to complete payment. Don’t want to change your payment experience? That’s okay, too! The inline payment forms that have always been present will still be available, and you can leave your settings untouched to continue to use them. Have any questions about the upgrade or the new plugin? Check out our updated documentation, or feel free to reach out to our team with questions. If we are currently using Authorize.net CIM with Accept.js and WooCommerce Subscriptions, will all our current customer data and subscriptions automatically be migrated to the updated plugin? Are there any additional steps that we need to configure the new plugin? [text] => User authentication failed due to invalid authentication values. Don’t we need to input the public key to accept to validate correctly? We see this input field was taken away from the plugin settings. Hey there, this error may mean the plugin needs to force regenerating the key (sometimes if it’s been regenerated via the ANet account, it can get out of sync) — we’re happy to help out with this! Please get in touch via our help desk and we’ll ensure the key is regenerated.